BACKGROUND: C-reactive protein (CRP) is an acute-phase protein secreted by hepatocytes during various types of tissue injury. We tried to determine whether the severity of an open fracture of the tibial diaphysis as classified according to the Gustilo-Anderson system corresponds to the degree and pattern of CRP response after trauma and infection. METHODS: This was a prospective study done over a six-month period on 48 patients with open tibial-diaphyseal fracture. Serial blood samples for CRP testing were taken seven times over a two-week period. The fractures were graded according to the Gustilo-Anderson classification and after surgery wounds were examined regularly for signs of surgical-site infection (SSI). RESULTS: Twenty-nine patients (60.4%) did not develop postoperative SSI and mean CRP levels peaked on different days for the different fracture grades with grade II, IIIa, and IIIb fractures all having mean peak levels of 52.2 mg/l. There was no association between the mean peak CRP levels and the fracture grades (p = 0.5). Those patients who developed postoperative SSI (19; 39.6%) still showed no clear association between mean peak levels and fracture grades (p = 0.48) and CRP levels also peaked on different days with grade IIIc fractures having the highest level at 67.7 mg/l. When fracture grading was excluded from data analysis, mean CRP levels for both groups of patients peaked on the third postoperative day with a higher value of 52.2 mg/l for patients with postoperative SSI compared with 47.7 mg/l for those without postoperative SSI, and the difference was significant (p = 0.015). CRP remained elevated up to the fourteenth postoperative day in patients with postoperative SSI while it showed a decline until it approached the pre-operative level in patients without postoperative SSI. CONCLUSIONS: This study has shown that the severity of an open fracture of the tibial diaphysis as classified according to the Gustilo-Anderson system does not correspond to the degree and pattern of CRP response after trauma and SSI. This is demonstrated by the erratic CRP response in both infected and uninfected open fractures of the tibia when fracture grade was compared with the kinetics of CRP response. The elevated CRP level on the third postoperative day and continued persistence thereafter in patients with SSI is, however, a potential early screening tool for infection before clinical signs of infection appear on the fifth postoperative day. The classification system for open tibial fractures most widely used in clinical practice is that of Gustilo and Anderson.1-3 Fracture grades range from I to IIIa, b, and c with progressive bone and soft-tissue injury as well as the degree of contamination and presence or absence of vascular injury requiring repair for limb survival. Tissue injury causes the release of cytokines that stimulate the acute-phase protein synthesis by hepatocytes.4 C-reactive protein (CRP) is one such protein whose kinetics during the acute-phase response can be used to predict the natural outcome of traumatic tissue injury and operative treatment and to monitor for complications such as postoperative surgical-site infection (SSI) in orthopaedics.5-7 Studies have been done that evaluated the use of CRP in various orthopaedic operations,8,9 including the use of CRP as a marker of natural response to injury and operative treatment in fractures of the tibia,10 but none has so far evaluated the use of CRP as an indicator of the severity of long-bone injury or as an early marker of postoperative SSI in open fractures of tibial diaphysis. The purpose of this study was therefore to determine whether the severity of open fractures of tibial diaphysis as classified according to the Gustilo and Anderson1-3 system corresponds to the degree and pattern of CRP response after trauma and SSI. All the fractures were graded during surgery using the Gustilo-Anderson classification system. To ensure interobserver agreement, a second opinion from a consultant orthopaedic surgeon on duty was always sought at the time of fracture grading in theatre. Blood samples were taken immediately upon arrival at the emergency department (day 0) and on postoperative days 1, 2, 3, 5, 10 and 14. One ml of blood was drawn into a plain vacutainer tube without anticoagulant (BD Vacutainer Systems, UK), allowed to settle for 20 minutes and the supernatant extracted and centrifuged (Beckman's TJ-6 centrifuge, USA) at 3 000 rpm for 5 minutes. The serum was extracted and stored frozen at -18ºC until CRP was tested. The frozen sera were thawed at room temperature and 3 µl of each sample was mixed with 110 µl of the CRP reagent that contained latex particles coated with anti-human CRP antibody (BioSystems SA, Spain). CRP concentration in mg/l was determined using the Cobas Mira CRP machine (Roche, Switzerland) based on the turbidimetry principle. Assessment of wounds during the postoperative period for SSI was done using the Centres for Disease Control (CDC) criteria.11 Infection was confirmed using symptoms and signs of infection, usually on the fifth postoperative day. No gram staining was done and culture and sensitivity were not part of the diagnostic criteria. 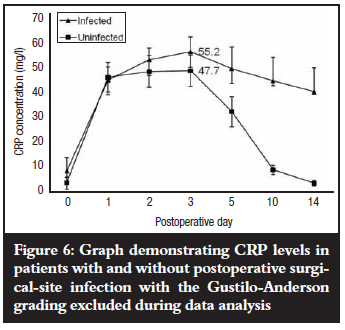 Patients were discharged on the fifth postoperative day and followed up in the out-patient clinic for two weeks, during which time blood samples were taken for CRP-level determination, and wounds examined for signs of persistent infection. Written informed consent was obtained from all patients and ethical clearance received from the Research Ethics Committee. Variables were defined as means with 95% confidence intervals and statistical significance was accepted for p<0.05. The Kruskal-Wallis test was used to test for significance between outcome groups (infected versus noninfected) and the t-test for significance within the groups. Initially, 62 patients consented to participate in the study, but 14 (22.6%) were lost to follow-up at various times before the two-week follow-up period and so results were analysed for 48. There were 45 (93.8%) males and three (6.2%) females. 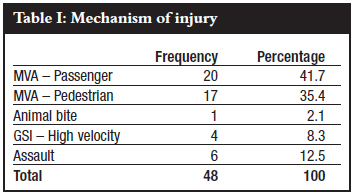 Most injuries (n=37) were caused by motor vehicle accidents (MVA) where those involved as passengers accounted for 41.7% and 35.4% as pedestrians (Table I). The mean age was 34.5 years, range 19-61 years, and modal age group was 38-43 years (n=13) as is shown in Figure 1. 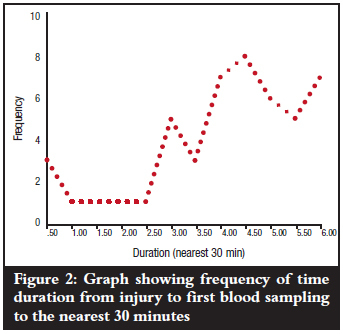 The mean duration from time of injury to first blood sampling (day 0) was 4.15 hours with a range of 0.5-6.0 hours and mode of 4.5 hours (Figure 2). 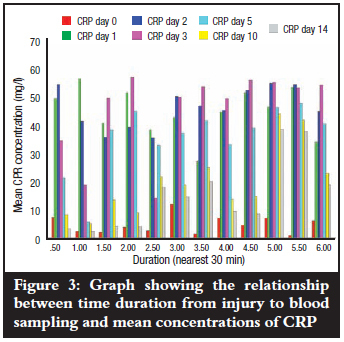 Mean levels of CRP at the various times of first blood sampling (day 0) did not show any marked variations (p=0.671) as is shown in Figure 3. All the patients could only estimate injury time to the nearest half hour. Two patients (4.2%) had a Gustilo and Anderson grade I fracture and neither developed postoperative wound infection, while seven (14.6%) had a grade II fracture and none of them developed wound infection. The majority of patients (23; 47.9%), had a grade IIIa fracture and seven (14.6%) got wound infection. Fourteen patients (29.1%) had a grade IIIb fracture of whom ten (20.8%) developed wound infection. Both patients with a grade IIIc fracture (4.2%) got wound infection (Table II). All infections were superficial and became clinically detectable from the fifth postoperative day. Mean CRP levels in all fracture grades in patients without postoperative SSI showed a steady rise from day 0, peaking between the first and third postoperative days, and gradually declining until day 14, when they approached the pre-operative level (Figure 4). Mean peak CRP levels did not show any association with the fracture grades (p=0.5) despite peaking on different days. Mean levels of CRP rose steadily in patients who eventually developed postoperative SSI with grade IIIa and b fractures peaking on the third and second postoperative days respectively, and grade IIIc fractures on the fifth postoperative day; then all declined slightly but remained elevated about seven-fold above the baseline pre-operative level by the fourteenth postoperative day. Grade IIIb fractures showed the lowest mean peak level but when compared with grade IIIc fractures, the difference was not significant (p=0.241). The pattern of a slight decline in mean levels (grade IIIb) followed by persistence did, however, remain essentially the same thereafter when compared with grade IIIa and c fractures (Figure 5). There was also no association between mean peak CRP levels and fracture grade (p=0.48). The kinetics of CRP on subsequent postoperative days for the different fracture grades in both groups of patients with and without postoperative SSI was not reflected in the severity of the open tibial fracture as graded by the Gustilo-Anderson fracture classification (Figures 4 and 5). 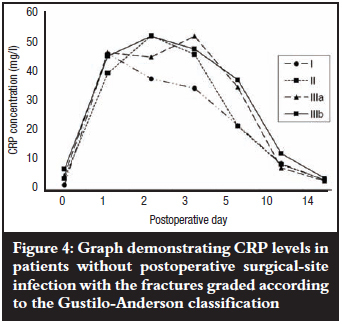 When fracture grading was, however, excluded from the data analysis (Figure 6), the mean peak CRP levels of 47.7 mg/l for patients without postoperative SSI and 52.2 mg/l for patients with postoperative SSI were both observed on the third postoperative day, and the difference between them was significant (p=0.015). 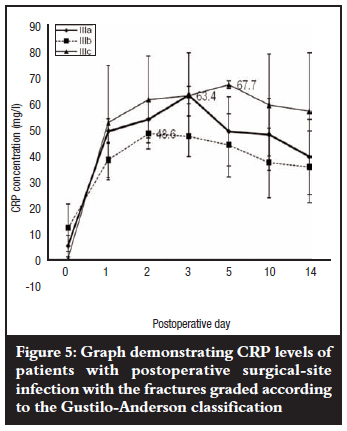 There was a steep decline in mean CRP levels in patients without postoperative SSI between the fifth and tenth postoperative days, followed by a slower decline up to the fourteenth day when it approached the post-injury pre-operative mean level on admission (3.6 mg/l). CRP remained elevated up to the fourteenth postoperative day in all the patients with postoperative SSI (39.4 mg/l). The results of this study show that the Gustilo-Anderson classification system does not correspond to the extent of both bone and soft-tissue injury due to trauma and infection as shown by the erratic CRP response in both infected and uninfected isolated open fractures of the tibial diaphysis. When the individual fracture grades were taken into account, there was no gradation in mean peak levels where one would expect a lower fracture grade to have a lower mean CRP level and a higher fracture grade, a higher level. Mean peak CRP levels for uninfected grade II, IIIa and IIIb fractures varied only slightly despite peaking on different days (Figure 4), and for the infected fractures (Figure 5) there was a wider range between grade IIIa and grade IIIb but the former was paradoxically higher than the latter. The significance of these findings is that clinical grading of open fractures with the aim of predicting severity of injury and treatment outcome should also include a measure of the body's acute-phase response. It also demonstrated that all patients who developed postoperative SSI had a consistent rise in mean CRP levels that peaked on the third postoperative day when the Gustilo-Anderson fracture classification was excluded from the data analysis and remained persistently elevated; a fact that can be used as an important screening tool in the detection of early postoperative SSI in open fractures of the tibial diaphysis before the appearance of clinical signs of infection on the fifth day. Serial CRP level measurements can further be used as a follow-up tool after institution of appropriate antibiotic therapy after SSI. In the literature, CRP is shown to be widely recognised as an early indicator of postoperative infection.12 It is, however, important to know the natural course of CRP in traumatic tissue injury and uncomplicated surgery to be able to appreciate any deviation from normal in the event of an infection. This study demonstrated a natural CRP response (in the absence of infection) similar to other studies,10,13 with the exception that here it showed that in the Gustilo-Anderson classification for open fractures of the tibia, the severity of injury (fracture grade) does not correspond with a concomitant higher CRP response. This is probably so because this classification system does not accurately reflect the severity of tissue injury due to its subjective nature during fracture grading14 and its reliance on mainly immeasurable attributes (with the exception of wound size) during physical examination in the operating room.15 Besides the unreliability of the Gustilo-Anderson classification in predicting the severity of tissue injury, deviations could also be due to unrecognised, closed soft-tissue injury sustained elsewhere during the traumatic event that led to the open fracture of the tibia. The unrecognised injury would contribute to the release of an excess of the acute-phase response-stimulating cytokines IL-1, IL-6 and TNF-α16 over and above those released as a result of the open tibial injury, thus accounting for the unusual CRP pattern for lowergrade fractures in comparison with higher fracture grades. Kallio et al10 found that the natural CRP response in the absence of infection was independent of the site or type of tibial fracture but depended on the method of treatment. Mean peak levels were observed on the second postoperative day, contrasting with our study, which showed mean peak levels on the third postoperative day. These researchers did not use any open-fracture classification system in their study. This result is plausible because the parameters used to determine the ISS are easily measurable and not as subjective as those used in determining the fracture grade according to the Gustilo-Anderson classification. Serial CRP measurements are employed in the diagnosis of early postoperative wound infection where peak levels are observed on the second or third postoperative day and subsequent persistence would be highly indicative of an early infection,19 a finding that is consistent with our study. Gustilo et al showed that higher fracture grades (severe injuries), are associated with higher rates of wound infection.2,3 Higher fracture grades would mean a greater extent of tissue injury and a higher CRP response in patients with postoperative SSI. When fracture grade was taken into account during data analysis, the results of this study did, however, show a much more erratic CRP response in the group of patients with postoperative SSI in comparison to those without SSI. 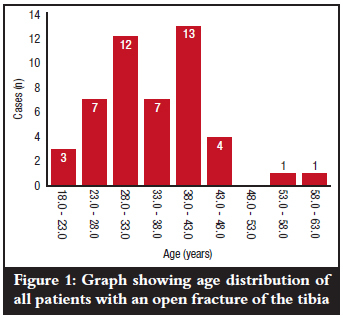 Grade IIIb fractures showed a lower peak compared to grade IIIa and IIIc fractures. This could have also been due to varied host responses to the acute-phase stimulus during injury and infection,20 a factor that this study was unable to determine. This study had limitations in that in both groups of patients (those with and without postoperative SSI), the number of patients in each fracture-grade group was not equally represented and so generalisation of the results may not reflect the true extent of the CRP response. Though there was no significant difference in time duration at first blood sampling and time of injury, the problem of memory recall of time of injury could have also played a part as the injury times given were all estimations to the nearest 30 minutes. Finally, there were very few women (n=3) in the sample, giving rise to the results of this study being male-gender biased. In conclusion, this study has shown that the severity of open fracture of the tibial diaphysis as classified according to the Gustilo-Anderson system does not correspond to the degree and pattern of CRP response after trauma and SSI. This is demonstrated by the erratic CRP response in both infected and uninfected open fractures of the tibia when fracture grade was compared with the kinetics of CRP response. However the elevated CRP levels on the third postoperative day in patients with SSI can be used an early screening tool for infection. A new but simple classification that incorporates a measure of host response to trauma and infection is recommended. This will, however, require a larger series of patients that will also include open fractures of other long bones other than the tibia only. No benefits of any form have been received from any commercial party related directly or indirectly to the subject of this article.